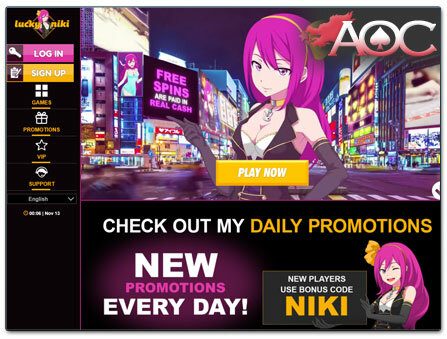 LuckyNiki Casino, which is also available to players in Japan, boasts a colourful Anime theme (featuring Susukino in Sapporo, if you haven’t noticed) – all online casinos in Asia. It offers a vast selection of games by NetEnt and other popular software providers. In addition to that, you are sure to find some of the best live dealer games as well as some more exotic games, such as scratch cards and virtual sports. While the site is available in Japanese, other players based in Asia can alternatively visit the English version of LuckyNiki Casino. Please note that Japanese yen is not supported as an account base currency; however, dollars and other currencies are available. Although LuckyNiki is considered a young online casino, it still gives players a safe platform to bet and play their favourite games. It is licensed by the renowned Malta Gaming Authority (MGA) and operated by TBM Ltd., whose family of online casinos includes brands such as SlotsMagic and is considered a reputable name amongst players all over the world. LuckyNiki Casino is certainly a one-of-a-kind gaming platform. Once you visit the website, you will encounter videos telling the story behind the casino host Niki. These little stories do not give you hints on how to win at the casino games but surely entice you to get in the right mood to play at this Japanese-style casino, while giving a fictional background story of how the brand arose. Via the tabs below you can find further details about LuckyNiki, such as the games on offer and the available payment methods for players in Japan. The website is available in Japanese. A wide selection of casino games including slots from well-known software providers such as NetEnt, Microgaming, NYX Gaming and others. LuckyNiki offers different live casinos. The first is provided by Evolution Gaming, the others by XPro and Extreme. Support available via email, live chat and phone. Most games are also available on smartphones and tablets. Fast withdrawals with e-wallets are offered. Other Asian languages are not supported. However, English is available as an alternative. As in many other online casinos in Asia, customers are required to play with US dollar as their base currency; Japanese yen as well as other Asian currencies are not supported. New players can claim a welcome package at LuckyNiki Casino on their first deposit. This bonus includes 100% up to $100 and 25 free spins on the Ninja Master slot. The wagering requirements for bonus money are pretty straightforward. Players have to bet 30 times the amount of the bonus money before it is converts into real money and can be withdrawn. Compared to the bonus requirements of other available online casinos in Asia, this is good value. In addition, there are no wagering requirements applied on free spins, which is another positive. This means, that winnings from free spins are immediately credited to the real money balance and therefore can be cashed out. To claim the welcome bonus, you have to use the bonus code “NIKI” at the casino’s cashier area. Once a registered player at LuckyNiki Casino, you are also offered different bonuses. Various promotions that change on a daily basis grant you not only bonus money but further free spins, cashback bonuses and other benefits. Keeping a look-out for these offers in your player account might therefore be worth your while. For those who play on a regular basis, benefit from LuckyNiki’s own special VIP programme, which consists of different reward tiers and grants a multitude of bonuses. According to how many points you earn while playing your favourite games, you will be rewarded with special bonuses, a personal VIP manager and giveaways. Each $20 bet in slots is equal to one reward point. In order to become a Gold VIP (level 3), one has to collect at least 1,001 points and you will be credited with $20 level up bonus and higher deposit limits. The more you wager, the higher your VIP status will become. LuckyNiki Casino covers a wide variety of slots by popular software providers NetEnt, Microgaming, NYX Gaming and others (see list above). The slots include flagship titles such as Starburst by NetEnt and Ariana by Microgaming. Of course, the online slots by SkillOnNet or Green Valley Gaming, such as the popular Ninja Master, are also featured. Hence the casinos’ software platform is based on the technology by the previously-named provider. All in all, LuckyNiki boast at least 800 slot machine titles alone, in addition to numerous virtual tables and live dealer games. Hint: If you are looking for a specific game or want to see all titles listed alphabetically, this is possible by using the search function. In addition, you can search by software provider, which creates a useful solution considering the vast amount of casinos games. Furthermore, the progressive jackpot section at LuckyNiki Casino features more than 20 jackpot slots including well-known titles such as Mega Moolah, Mega Fortune and King Cashalot. 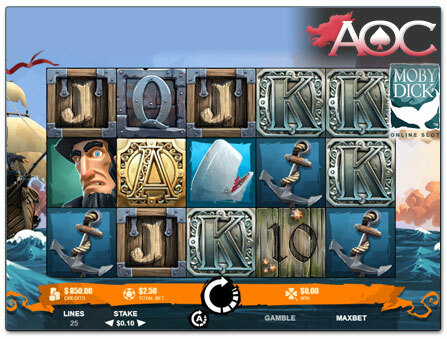 Of course, there are also various slots with Asian themes such as Koi Princess, Fortune 8 Cat or Huangdi. The website is easy to navigate, both on desktop as well as on mobile devices. In addition, no download is required to play any of the offered games. Inexperienced players may also use the demo mode to catch a first glimpse of LuckyNiki’s games. As mentioned before, the gaming platform provides players in Asia with a dozen high class live dealer games, available from four different providers: Evolution Gaming, NetEnt, XPro and Extreme Live Gaming (see examples below). Games include the classics such as Baccarat, Roulette and Blackjack, in addition to some lesser known titles like Three Card Poker and Casino Hold’em. To place bets at the live tables, one doesn’t need to spend a fortune. A round of live Blackjack for instance can typically be played from $1 while the maximum limits won’t disappoint anyone, which is good news for regular or VIP players. As you would expect, LuckyNiki Casino is also available on mobile devices. To play on your smartphone or tablet, you can simply use the browser, which is already installed. iPhone users have to create an app on their phone in order to play at LuckyNiki Casino. This app distinguishes itself a bit from the regular version of the mobile site, but includes every function necessary, as well as the same game selection offered for other mobile devices. In addition, you don’t have to set up an individual account for mobile as your login credentials are valid on both the mobile and desktop platforms. When we are talking LuckyNiki on mobile, we are talking games, since the selection is almost as vast as in the desktop version. As in all other mobile casinos you won’t find all the games, as they are being continuously adapted to fit the smaller format. But all the classics will be available for you to play regardless (this includes the games mentioned above). Although the casino is a particularly good choice for Japanese players, you are not able to set up your gaming account in yen as the base currency. However, players can create their account using US dollars as their currency. Of course deposits can still be made in Japanese yen, but the value will be converted into dollars before you commence play at LuckyNiki Casino. You can credit your account using a variety of common payment options, such as credit card (VISA or MasterCard) and e-Wallets (ecoPayz or EntroPay). The minimum deposit is $20. LuckyNiki Casino does not charge any fees, no matter which payment method is used. It’s a pity though that players cannot withdraw more than $5,000 at once or more than $10,000 within a month. In case of winning one of the progressive Jackpots, players should definitely contact LuckyNiki’s customer support team in order to find a way of adequately cashing out. Just as with the deposits, the minimum withdrawal amount is $20. Withdrawal requests take no longer than 48 hours, but are often processed earlier. Q: Is LuckyNiki a Japanese online casino? A: With its Anime theme, it may look like a Japanese online casino site, but really, LuckyNiki is a Maltese-licensed casino. However, it isn’t just a Japanese theme you’ll find there. The casino is also available to play in Japanese. Also most of the casino games are available in Japanese, but in English too, of course. Here you find more information on the casino software used in online casinos. A: Pretty much. LuckyNiki doesn’t really block players from any country. Of course, there may be a few local restrictions you may need to get around (perhaps with a VPN? ), but officially, all players are welcomed at this casino. Q: Which currency can I use to deposit at LuckyNiki? A: Despite the website being available in Japanese, the Japanese yen is not an accepted currency at LuckyNiki, nor other Asian currencies are supported. Asian players in general will, therefore, find the US dollar an ideal currency to use when playing at the site. Q: Can I obtain support and assistance in Japanese? A: Yes. Customer support is available via live chat, e-mail, and telephone, with Japanese-speaking operators on hand to assist you. Asian players who don’t speak Japanese can obtain assistance in English, though. Q: Can Asian players claim bonuses and promotions at LuckyNiki? A: Some online casinos do tend to be restrictive about the types of promos and bonuses you can claim, depending on where you reside. However, Asian players are invited to claim all the welcome bonus, deposit offers and significant promotions at the site. The only promotions they may be excluded from are prize draw competitions which specify that you must live in a particular region to claim a prize.